Since I left Southern California I’ve somewhat fallen off the yoga wagon…just a wee bit mind you. No cause for alarm…nothing serious! In my defense, its been easy to do. Living in California, I was less than five miles from a lovely yoga studio, YogaWorks. I was lucky to be a member of YogaWorks for well over two years. I say lucky because my membership was truly a luxury as I also belonged to a wonderful gym that had every piece of equipment known to man plus all the group exercise classes (including yoga) and a great pool as well. Not only were/are the YogaWorks teachers excellent and classes varied enough to appeal to any level, but the environment was so esthetically pleasing and soothing to the soul with its bamboo floors, tranquil wall colors and a beautiful wall-mounted fountain from which water cascaded down in a calming fashion from the ceiling to the floor collecting into a small pool. I loved sitting in the lobby before class; the sounds of the falling water mixed with melodious Indian or peaceful new wave music….sipping on unique blends of tea or iced lemon water while waiting for the yoga studio doors to open. I even liked watching sweaty, and sometimes sleepy-eyed people exit their class …they’d pour out into the lobby and OOH and AH about how great the class was….how wonderful they felt; such a camaraderie amongst so many people who came together to learn, to enhance their practice and ultimately quiet themselves, if only for ninety minutes, before going back to the chaos that often comprised the rest of their day. My first yoga experience began nine years ago with a teacher that taught in a corporate setting. It was a one-hour class tailored for the lunch crowd corporate folks (I wasn’t one of them… simply the spouse of one). I’ll admit to being reticent about yoga at first….I’d seen enough on T.V. (or in magazines); those emaciated men, heads wrapped in a turban, their limbs wrapped around their necks, chanting unintelligible words…that was decidedly not for me. But yoga teacher Lou turned out to be the perfect person to nudge me on to the yogic path. I had no idea that she would become my “guru” of sorts and I’m eternally grateful; she has turned out to be a great teacher and friend, and yes…sometimes a mother. She even nudged me ever so subtly into a 200-hour yoga teacher training. It took a lot of convincing mind you; it was not in the budget and I was paralyzed with fear over the thought of actually teaching yoga. But she, along with my husband and the teacher trainers themselves convinced me that the goal of a teacher training does not have to be teaching (who knew? )….it is quite simply a path to learning more about the ancient practice and deepening my own yoga experience. Whew….that was a relief! With the pressure off to becoming a yoga teacher I got through the training, certificate in hand and yes…still decided that teaching yoga wasn’t in my immediate future. I’d taught aerobics years before. I’d gotten the group exercise certification and taught aerobic classes for two years and that burned the fire right out of me. Teaching yoga is an entirely different animal, if you will, than teaching aerobics. I knew I’d have to keep taking loads of teacher trainings, seminars and workshops in order to feel confident and competent enough to teach a really good class. I’m fine with that….and who knows….maybe….later….even in another life…I’ll travel down that path. All is good…. This brings me back to now. Why haven’t I consistently maintained my practice after the move to middle earth? I’m struggling to answer that question. Maybe it’s because there are less than a handful of places to practice here and one has to drive a fair distance to get to a class. There is a tiny studio one mile from my house but its Bikram (hot) yoga and I’ve no interest in practicing yoga in a 105-degree studio. It’s hot and humid enough outside that just walking to my mailbox I feel I am getting the Bikram experience. In fact, last year we suffered through three weeks straight of 105-degree temps (another reason I give the moniker “middle earth” to this here place where I live. I figure it is more positive than saying I live in HELL all the time, right?!) And, I did attend one class with friend Lou when she was visiting (actually, it was a Pilates class) but the class and the locale just didn’t resonate at the time; I was too fresh from moving to a place I didn’t want to be to give it a chance I suppose. Rest assured, I am not ruling out a second or third go of it. I’m moving like a turtle with regards to all things Alabamian. Fortunately I am able to use a terrific resource: on-line yoga classes. After my last class at YogaWorks I tearfully hugged my favorite yoga teacher Jorge and explained what was happening; I was moving to God-awful Alabama and from the looks of it there were only a couple of yoga studios…and no YogaWorks. “Can you imagine that?” I cried. “I need to practice in a class environment Jorge…I’m just not disciplined enough to go it alone.” Jorge hugged me, patted me on the back and said “Sweetie…it’s going to be all right…really. So here is what you’ll have to do…..” With that, he wrote yogaglo.com on a piece of paper. “This is a site where you can take yoga classes on-line. You can even try it out for two weeks free.” I was very skeptical about the whole thing but I was desperate enough during the move to try it; I did not want to lose the connection to my physical (albeit aging) self…nor did I want to lose the most important part of what a regular practice was providing me…. a deeper spirituality…. a more meaningful connection with myself and God. So…since moving to middle earth (over a year now) I have been taking classes on-line. I’ll swear it really is like being in a yoga studio. Almost. Still, my practice has been haphazard and just the other day I figured out a possible reason…one which, obviously, I must overcome if I am to get back into a regular practice. I’m alone. It’s easy to be in a pose and then stop to answer the phone….or go to the bathroom and then never get back to the mat! Once I was in the middle of a head stand and decided I wanted to break for a handful of almonds. I didn’t get back to the mat. So… No one is around. It’s just me. Well…almost; there is the poodle. He’s often laying by my yoga mat when I try to practice. It never fails; I think poodle is fast asleep (even snoring) but in an instant he thinks its time to play…after all, I am often down on all-fours when I’m in cat-cow pose or downward facing dog. Poodle is awake in a flash. He wags his tail, his tongue hanging to one side of his mouth which is open in what looks to be a smile….He drops his squeaky red ball complete with slobber on to the mat as if to say “I’m ready! Yippee….let’s play!” I try to put poodle in another room but then he whines. Instead of breathing Ujjayi I’m cursing at the poodle. Not good….sigh. (On a positive note, I was able to practice yesterday….poodle apparently still dog-tired from a weekend of playing. He didn’t move a muscle for my entire session. Bliss. 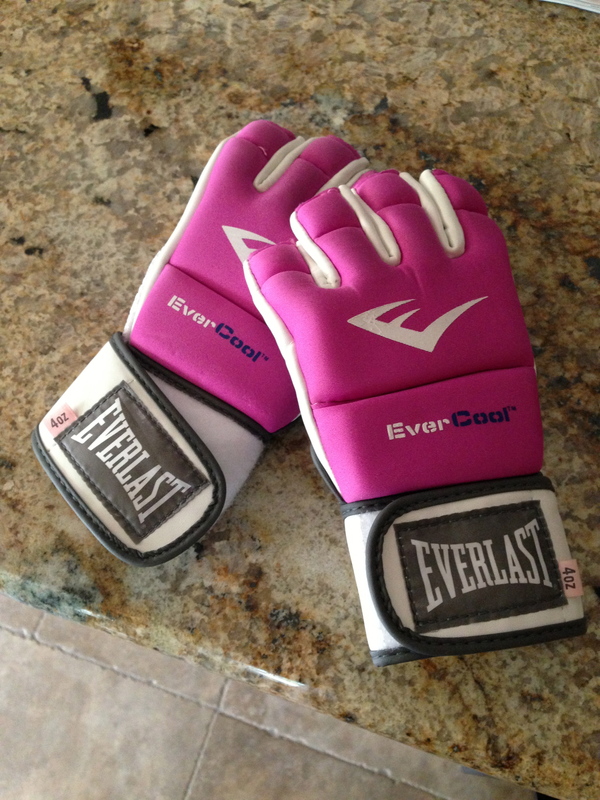 Pink gloves…only color I could find. In the end, it seems I need to be around people…in a more structured environment to keep me honest on the mat. I’ve got to find a balance between on-line yoga and something else. So, I’ve recently tried a yoga class at my gym. The teacher was OK but she was so shockingly thin that I just could not look at her…not to mention the southern drawl so thick that I could barely contain a giggle. Clearly, I’ve got to keep looking or give in to the drawl of “So now get to your Ujjayi breath y’all.” I’ve also started taking a heavy punch bag class. What? you say! Indeed! It’s a physical practice on another planet…diametrically opposite from a yoga practice. Om, Shanti, Om mantra and Ujjayi breathing versus grunt, grunt, jab punch, jab, and literally kicking the stuffing out of a heavy punch bag. That said, all that grunting and punching is helping me through this transition to middle earth, as well getting me through continuing heartbreak and angst over family issues. It’s easy to put an image to the bag and get it ALL out…on the bag! It’s all good….really! 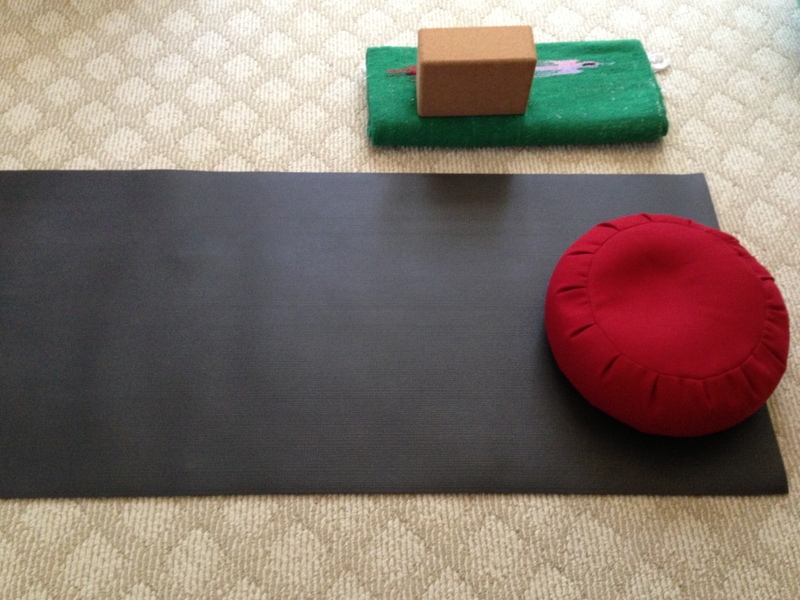 Om, Shanti on some days….grunt and punch on other days. That’s my balance….for now….and it’s working. It’s a bliss I can live with.